Preheat oven to 170°C (150°C fan-forced) and set aside a 6 cup capacity loaf pan. Place half the butter with all dark chocolate in one small saucepan, and remaining butter with all white chocolate in another small saucepan, and allow both to melt. Add half the milk into each saucepan and stir until smooth. Dissolve coffee in boiling water, then add to dark chocolate mixture, stirring until smooth. Allow both mixtures to cool for 10 minutes. Sift together half the flour, sugar, baking powder, salt and all the cocoa, then mix with half the almond meal. Gently stir into dark chocolate mixture then gently whisk in 1 egg until smooth. Repeat the same process with the remaining dry ingredients and egg with the white chocolate mixture. Heavily grease fluted loaf pan with oil or melted butter, ensuring all crevices of the pan are well greased, then dust with sifted flour. Invert pan over the sink and tap gently to remove excess flour. Pour dark chocolate batter into pan, gently coating sides of pan to give the finished cake a completely dark exterior. Pour white chocolate batter into dark batter, running a skewer sparingly through the cake to create an interior marbled effect. Bake cake for 50-55 minutes or until a skewer inserted comes out clean. Allow cake to cool for 15 minutes in the pan, then turn out onto a wire rack and allow to cool completely. If cake is stuck to the pan, placing the entire pan (open side up) in a tray of boiling water for 1-2 minutes expands the metal pan, allowing easier release of the cake. Melt one third of sugar in a medium saucepan over low-medium heat. Continue adding sugar over the melted sugar in small additions, until all the sugar has melted and you have achieved a dark, amber colour. Remove the pan of caramelised sugar from the heat and quickly stir in butter and cream, mixing thoroughly and taking great care not to burn yourself as the sauce bubbles. Return the pan to the heat and keep mixing until the sugar, cream and butter are mixed through, and caramel sauce has thickened (5-10 minutes). Add salt to taste, then leave to cool to room temperature until use. Sift cocoa and icing sugar over cake (this is purely for aesthetics and can be omitted if desired). 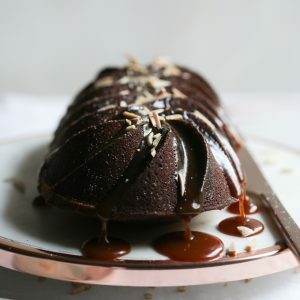 Drizzle with salted caramel sauce then sprinkle with roasted almonds and serve.